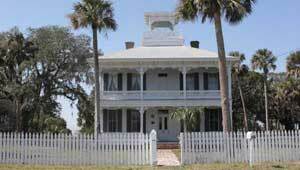 Featuring lacy porches and a widow's walk, this Victorian house at the mouth of the St. Johns River was purchased as a summer home by Napoleon Bonaparte Broward, Florida's 19th governor, in 1897. In 2004, TPL conveyed the house to the National Park System as an addition to the Timucuan Trail State and National Parks, where it will serve as a gateway to historic Fort George Island and the parks. Cooperatively managed by the city of Jacksonville, the state of Florida, and the National Park Service, these parks protect historic and prehistoric sites and some of the region's last unspoiled coastal wetlands.